She’ll tour her upcoming album Remind Me Tomorrow in 2019. 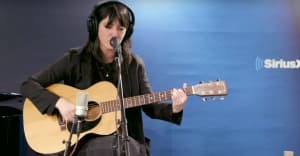 In early October, Sharon Van Etten returned with the synth-poppy new track "Comeback Kid," the first single from the upcoming Remind Me Tomorrow, her first album in nearly five years. In the song's video, directed by Jonathan William Turner, Van Etten sings while photos from her own collection and some dancing animations are projected on top of her. In a press release, Van Etten explained how the video bloomed from her evolving understanding of the song: "As the lyrics for ‘Comeback Kid’ unfolded, I realized I was talking about many selves: the kid, the adult, the sibling, the friend, the neighbor. I imagined a projector streaming over me of memories, unclear if they are mine or someone else's, confronted by the disorientation of time and perspective. Jonathan William Turner helped me to convey these struggles of self, forgiveness, and living in the now." Remind Me Tomorrow is out January 18 via Jagjagwuar. Check out Sharon Van Etten's global tour dates below.